One of the best things about the Playstation 2 was that you could play DVDs on it. Around the time I got one, I managed to procure a small TV somehow. Then, one night, I made the move – up to my room they went. That heady combination led to many late nights gaming, and watching movies. When I started working a Saturday job, I bought pre-owned games and DVDs by the dozen. The summer holidays of Year 9 were like a crazy, self-funded term at a film school. My curriculum was as varied as you’d imagine a teenage boy’s to be: Bond, Rambo, Conan the Barbarian, Predator, Under Siege. Then, at Christmas, I got the complete Rocky box set. I can’t remember if I managed to watch them all in one sitting or not, but it was pretty damn close. At the time, I was simultaneously extremely skinny and ridiculously out of shape. I’d never been in shape! I didn’t play any sports, or even think about why anyone would want to. My diet consisted of anything and everything – bags of donuts from the tuck shop were a staple. I just wasn’t connected to my body in any way. I had absolutely no drive or discipline: physically, or in any other area of my life. I was simply floating along, letting things happen to me. For some reason, seeing Rocky control his body in that way, deliberately putting himself through hell to become stronger, faster and better in pursuit of a worthy goal, changed the way I looked at the world forever. Ringside at the final fight. I started doing pushups, situps and pullups in my bedroom. I progressed onto making contraptions out of cinder blocks, sticks and rocks. I’d load up Sainsbury’s ‘Bags for Life’, and haul them around in a crazy circus act of a workout. Eventually I started running too, with absolutely no finesse, strategy or understanding. I literally just ran around the block in plimsolls. At first, I could barely get to the nearest lamppost and back before I was out of puff. But, it filled me with a kind of joy different to anything I’d ever experienced. At 17, I joined a small, local gym and started lifting weights properly. From there, I’ve not looked back. I’ve become more and more addicted to exercise over the intervening years. It’s slowly formed a central pillar in my life. It grounds me. I know that wherever I go, whatever I do in my life, physical exertion will be a part of it somehow. Exercise showed me how the actions I took had direct impact on outcomes. If I chose to do pushups and pullups, I could literally see a physical development in my chest and back muscles in a matter of weeks. I’d never thought of things in that way before. The realisation was incredibly empowering. It didn’t take long to start applying that understanding into other areas of my life: the more I read, the more knowledgeable I became. The greater my effort into thinking clearly and having challenging conversations, the better my ability to communicate. 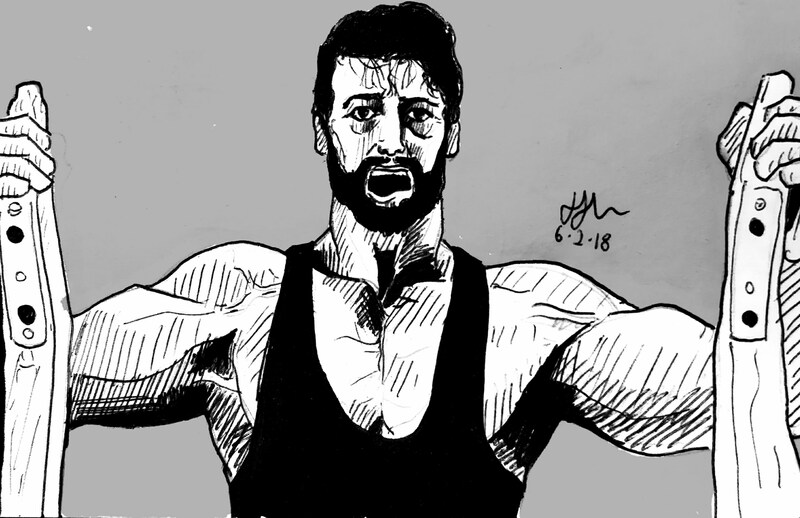 Rocky IV was the way I discovered self-discipline. And that’s at the root of everything I do today. So… what’s the point? Why did I tell you that story? Well, I’m not saying Rocky IV is going to be as transformative for you as it was for me. But you don’t know what film, song or book could be. It might be anything, and it may arrive in your life at just the right moment to make a difference. So deliberately expose yourself to new things. Go in with an open mind to every book you read, every TV programme you watch, every conversation you have – and maybe even every blog post you read. In being curious, thoughtful and ready to act on your convictions, your mind will become a fertile ground for new ideas. And, if that moment of realisation hits, you’ll be ready. Thanks for taking the time to read and comment – it’s absolutely iconic. I’m excited for Creed 2, reckon that’ll be a cracker too.